Monday. We meet again. Another weekend has passed us by and yet another weekend of me promising myself that I will eat well (by “well” I really mean healthy-ish). And yet again, another epic fail! Ugh. Why is it that when the weekend rolls around I throw out all my food rules that I so diligently follow during the week?? Gone are the salads, lean meats, veggies, calorie counting, and exercise that I make obligatory Monday through Friday only to be replaced with booze, convenience food, and guilt on Saturday and Sunday. Now don’t get me wrong, I live for the weekends and I love them! I always have a great time–I go out with friends to happy hour, dine out at amazing restaurants, lay on South Beach, hit up some cool bars and clubs, and take advantage of the great weather in Miami. I don’t sit at my house with a bottle of vodka and a vat of ice cream watching The Notebook while perusing the personals on Craigslist. Ok, maybe once in a while I do. 🙂 Totally kidding. My weekends are usually non-stop and perhaps that’s why I throw out all my food rules. I do so, so, so well during the week and then I drink and eat crap all weekend! Grrrrr. Oh well….I justify it by telling myself that during the week I’ll work extra hard at the gym and really watch what I eat. And, honestly, for the most part I follow through on that promise. I work out 4-5 times a week, watch my carb intake, eat tons of fruits and veggies, and rarely consume any alcohol. As I’m writing this, I guess it doesn’t sound that bad. 5 out of 7 days really isn’t a bad ratio. But those loaded steak nachos and 2 double vodka/sprites that I had yesterday are still lingering in the back of my mind and an overwhelming sense of guilt is still inching up in a sly way. Creeper. And that was only Sunday…let’s not even discuss the rest of the weekend. We’re not going there. In any case, we arrive to Monday and my body is just craving, screaming actually, for something healthy, green, and nutritious. This is how Detox Monday came about. I guess it’s the same thing as “Meatless Monday”, but Detox Monday sounds like you’re doing something important for your body so I like that title better. Whenever I’m feeling especially guilty about what I’ve eaten during the weekend, my dinner on Monday consists of something über healthy–like, ALL VEGGIES healthy. And then suddenly something magical happens–the guilt subsides, I feel better about myself, my body loves me again, and everything is right with the world….until Friday rolls around. Tonight I guess I made something like a side-sampler of sorts. All side dishes, all vegetarian, all delicious. 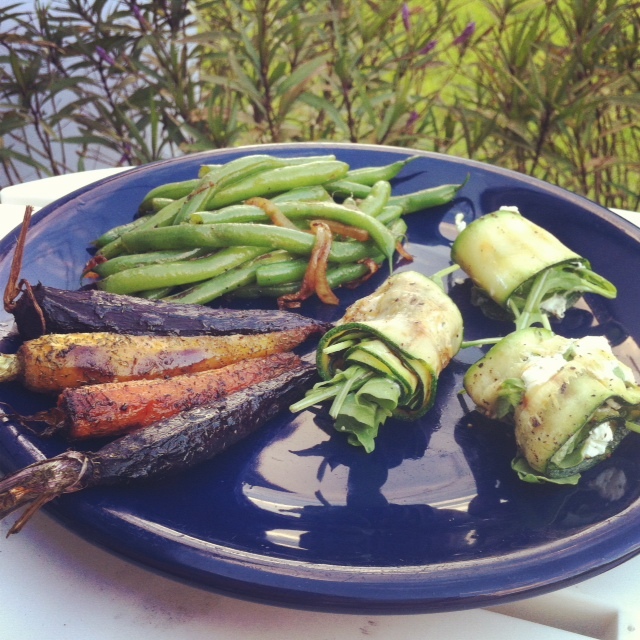 Roasted baby rainbow carrots with dill, zucchini rotolini with goat cheese and arugula, sauteed green beans, and a simple salad. If this won’t nourish your body and make you happy then I don’t know what will….let’s do this. Since you have three things going on here you need to multitask a bit. The first thing you should get started on are the carrots because they’ll take the longest. Preheat your oven to 375 degrees. Peel the carrots (or if they’re already in the bag they are peeled already). Microwave them and then coat them in olive oil, dill, salt, and pepper and place in your oven. Now, put some water on to boil for your green beans. We’re going to blanch them before they’re sauteed. For the zucchini, use a mandolin grater and create long thin slices. If you have a grill, you’re awesome and I’m jealous. I used to have one but now I don’t so I’m using a grill pan. Not equally as awesome but it gets the job done. 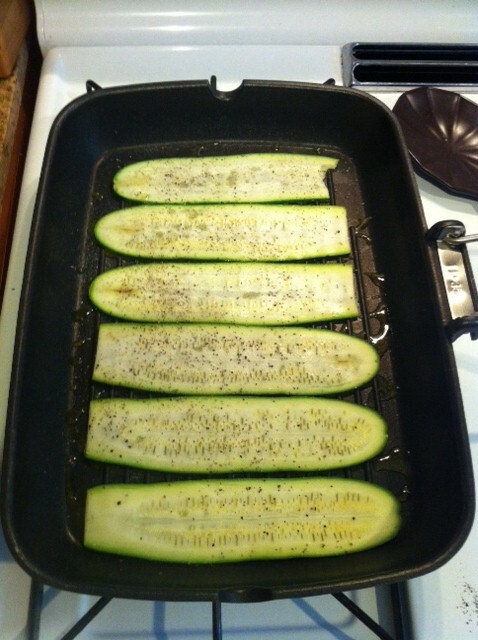 Heat up some olive oil and sautee your zucchini slices until they’re charred and yummy looking. Make sure they’re pretty thick or they’ll fall apart like some of mine did. Oops. Place those aside so they can cool. At this point your water should be boiling and you can toss in the green beans. You only want to cook these for a few minutes and then drain and put in an ice bath or just run some cold water over them if you’re lazy like me. Let them cool for a few minutes and assemble your zucchini rotolini. Shmear the goat cheese with a spatula, sprinkle some chopped parsley, and place arugula on top. Now just roll it up! Cute! Check on your carrots. I don’t like them mushy but maybe you do so the cooking time will depend on your preference. Now for the green beans. Heat up some oil in a pan and sautee your onion with some salt and pepper until golden brown, toss in your green beans and cook until they’re a bit browned and crispy! Toss in some fresh parsley at the end. Now plate everything, devour it, and feel good! I want to give a shout-out to the blog FunnyLove for the idea about the roasted carrots. Their recipes rock and they make me laugh. Go check them out! ← Back to basics–The stinking rose, allium sativum, or just plain ol’ garlic! I try to Detox once a month for 9 day’s, but I can never get pass day 3!